All returns require an RA number. Please contact us at 1-800-449-8991 for this number. No returns will be accepted without it. 1. If you receive an item that was damaged in delivery, please refuse delivery or contact us at once at 1-800-449-8991. If you are unable to reach us at that moment, and chose to accept delivery, please note the damage on the shipping receipt before signing the receipt, and retain all shipping materials for a damage inspection by the shipping company. Any items damaged in delivery and returned in original packaging and an un-used state will be replaced ASAP. Any items accepted for delivery when damage is acknowledged must be inspected by the shipping company, with the box and all packing materials available for inspection, before the item may be replaced or repaired. 2. If you have changed your mind, and decide to cancel the order after it has been shipped but not received, you will be refunded the purchase price, less any shipping fees involved. If you paid by credit card, your card will be refunded within 30 business days upon return of the item to American Wheelchairs. If you paid by check, a refund check will be issued within four weeks of return of the item to American Wheelchairs. 3. No returns will be accepted on custom orders of ramps, scooters, electric wheelchairs, lifts, walkers/rollators or manual wheelchairs. No returns will be accepted on lift chairs with added options of heat or massage. 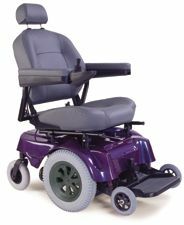 This includes modular ramps, any custom sized ramps, custom size electric wheelchairs, manual wheelchairs or scooters and any electric wheelchair or scooter ordered with custom accessories such as an electric seat or welded attachments. 4. If you receive an item that just does not work for you, you may return it within 30 days of delivery. You must first call for an RA number. No returned items will be accepted without this number. Please write this number on the outside of the return package, as well as on a piece of paper with your name, address and phone number and place it inside of the return package. You will be responsible for the cost of the return shipping, and insurance of the package. The item must be returned in the original box with the original packing materials and with every accessory, battery, charger and manual or any other component that arrived in original shipping. A credit to your account cannot be processed unless all original components are returned. Once the item and all of its original components are received in our warehouse in the original box, with original packing materials in unused and undamaged condition, you will be refunded the original purchase price, less a 20% restocking fee, and our original cost of shipping. If you paid by credit card, your card will be refunded within 30 business days of return of the item to American Wheelchairs. If you paid by check, a refund check will be issued within 4 weeks of return of the item to American Wheelchairs.